Damn, Glu Mobile — just damn. 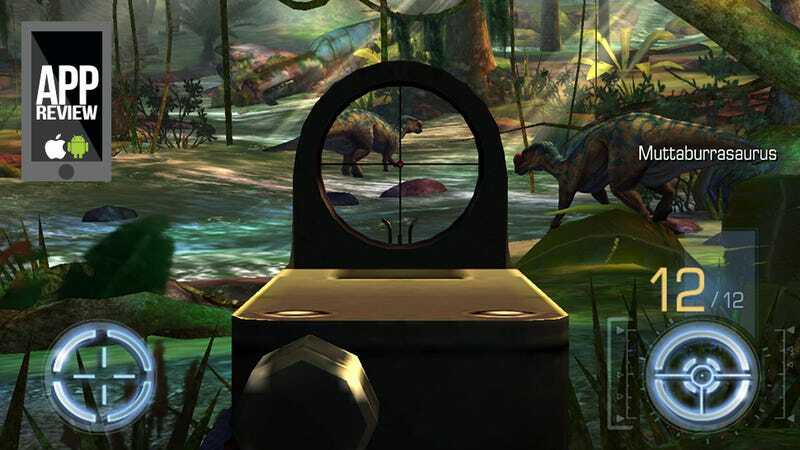 You took my favorite mobile guilty pleasure — Deer Hunter 2014 — replaced the animals with prehistoric creatures, juggled some textures, added some new weapons and bam, I'm hooked all over again. Well played, Dino Hunter: Deadly Shores. When I say this is pretty much the exact same game as Deer Hunter 2014 I am not exaggerating. The stages, which serve as backdrops for the series' trademark bite-sized hunting missions, are the same ones from the deer version, with a fresh coat of paint. The weapons, aside from the incredibly expensive fantasy premium ones, feel exactly the same. The music is the exact same music. Even the menus are similar. But I do not care, because I am felling dinosaurs. Why am I felling dinosaurs? No clue. If I had to guess, I'd say we're making tasteful dinosaur jackets, festooned with ancient bird features. I've been playing this stupid thing non-stop since it came out last week, patiently waiting out the energy meter — a mechanic I find completely abhorrent in every other game. I kill to earn money, use that money to upgrade weapons, use those weapons to kill more dinosaurs — it's an endless cycle. A wonderfully stupid endless cycle. It's as if Glu mobile was listening in on my mind as I imagined how good Deer Hunter 2014 would be with dinosaurs. We'll confirm that if their next game is Human Hunter 2014.